Lister Bandage Scissors are ideal for cutting gauze and bandages. This product is constructed of stain-resistant steel for long-term, high-quality use. 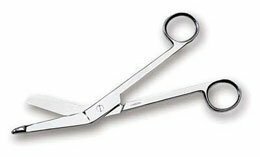 These blunt sided utility scissors resist corrosion and rusting and are autoclavable. Made of stain-resistant steel that is designed to be used for medical professional and personal use.